Recently I did some work with the owner of a successful digital agency in Sydney, called John. He is young, super switched on and has a successful business that has been established for a few years. It’s profitable, has a decent sized team in Australia and the Philippines, and does work for some big name companies as well many small and medium businesses. The only challenge was that John was extremely frustrated. As his business grew, he became busy, and the more the business grew the busier he got. It was not unusual for him to be working 80 – 100 hours per week. He was frustrated because he felt stuck, like he was at a glass ceiling and couldn’t break through. He had all these great ideas for the business but the weeks seemed to vanish before he could get around to implementing them. Worse still for him, revenue and growth had stagnated because he was personally at capacity and he felt like he would never achieve his lifelong vision of building an international brand. What John didn’t have, was a framework or method of staying focused on the things that would make an impact on himself and the business. Instead, he was getting way too caught up with the reactionary day to day tasks that kept popping up and he stopped being proactive. To remedy this for him, we worked through a quick and simple framework designed to give clarity, traction and momentum towards goals that make a meaningful and lasting impact on your business. At first glance, this framework appears simple, and in truth it absolutely is! I specifically designed it that way. You see, over the last 10 years of helping businesses grow, it has become abundantly clear that the simple things get done. 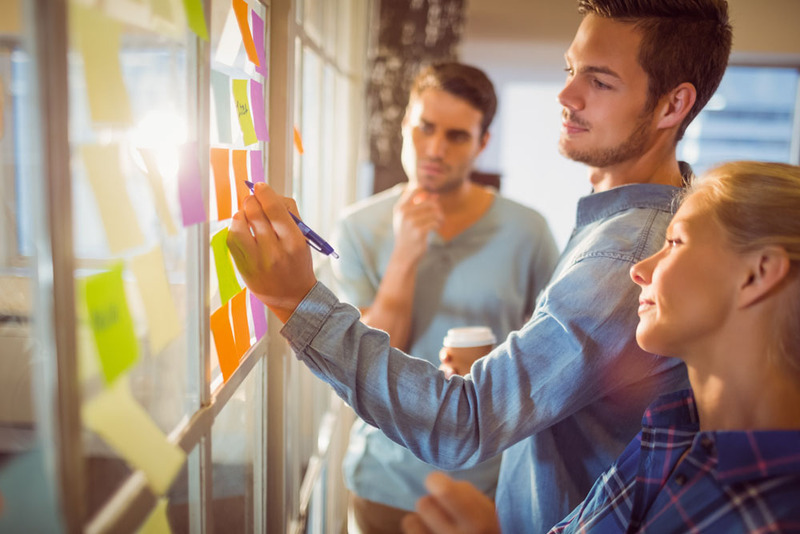 Anything that is slightly complicated or a minor hassle to implement gets put in the “too hard basket,” or on the “I’ll get to it later list.” This is especially true when people have more tasks to do than hours in the day! My mentality is that if it’s too complex to easily draw on a whiteboard or piece of paper, then it’s too complex to easily implement. 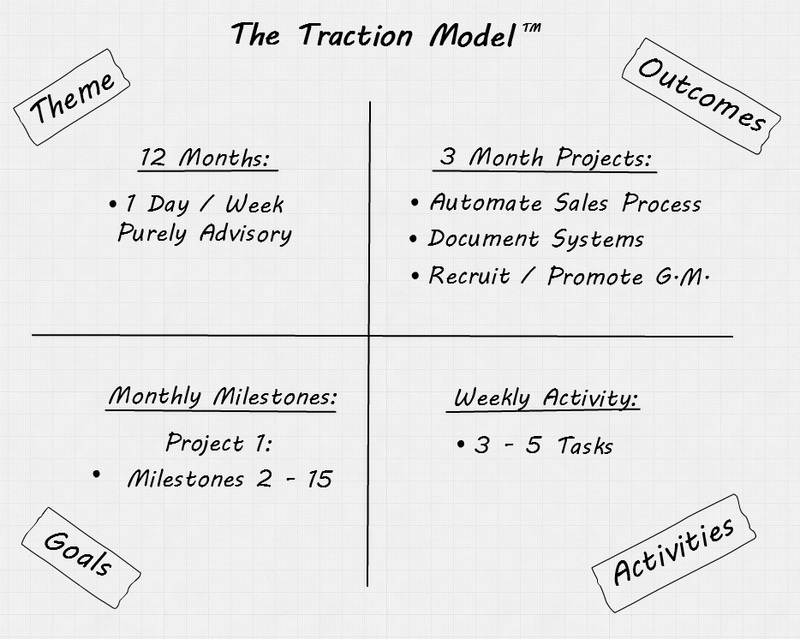 The Traction Model is so powerful because it is so simple and it can be done in about an hour. I asked John to clearly define to me where he would ideally like the business to be in 12 months’ time, and we put this in the top left box as our theme for the year. Well, over the years I have found that 12 months is about as far as most people can practically think forward, it’s also a good timeframe for implementation and any longer than that and the goal posts tend to move. John told me that in 12 months he wanted to be in a position where he didn’t need to be involved fulltime in the running of the day to day business, and wanted to take on more of an advisory role for 1 day a week. Based on this, I asked him what outcomes needed to be accomplished so that he could realise this short term vision. John now had 3 outcomes, which became the 3 main projects that would create significant impact for the year and we put these in the top right hand box. Usually, each project should take about 3months to implement properly. The next stage of the framework is to focus on one project per quarter (with a few weeks grace period to allow for unforeseen circumstances). We decided to focus on automating the sales process first as this was taking up most of John’s time. I got John to break down the project into smaller goals/milestones, and filled in some of the blanks. After this exercise, we ended up with 14 steps or milestones. With 3 months to complete this project, we then assigned certain milestones to each month and put these in the bottom left box. This gave him a very clear overview and snapshot of what needed to be accomplished. Usually, each project has 2 – 15 milestones/goals. Finally, having an overview and snapshot is not yet enough, because what’s still missing is the crucial element that drives results. You need to actually do the activity and tasks to ensure that the milestones/goals are completed. This is what the bottom right-hand box is for. You pick a milestone and break it down into the tasks that need to be done in order to complete it. There are usually 3-5 things and these become the activities you need to accomplish for the week. At the beginning of each week, you simply repeat the process until all the milestones for the project are completed. John used this framework (with “Wunderlist” to keep track of the weekly tasks) and kept me updated each week. We are now just over 8 months into using this framework and John is absolutely killing it! He now only works 2 days in the business, mostly in a training and advisory role and spends a lot more time with his young family. He’s looking to reduce this further in the months to come. He has a complete systems manual for his business which he will use to fulfil his lofty Vision by licensing to other agencies around the world. His General Manager started 2 months ago and is off to a very strong start, taking a lot of John’s workload. He still doesn’t quite believe how quickly and fast such significant results were achieved. So what can you learn from John’s experience? George Zenon is a multiple award winning Business Coach, presenter and author with a 10 year background in helping businesses maximise their revenue and profit growth as well as facilitating peak team performance. George has consistently ranked in the top 1% of Coaches globally, personally worked with hundreds of businesses in over 30 industries and presented to thousands more. He led the Client Delivery department of the largest Coaching Firm in the world, building the top performing Business Coaching team in the process. He believes that the way to facilitate strong growth is through impactful leadership coupled with simple, yet powerful frameworks for all areas of business that are easy to understand, can be immediately actioned and consistently implemented.